Eleven historic lighthouses and three museums along the New Jersey shore open to the public on October 17-18. Eleven historic lighthouses and three museums along the New Jersey shore open to the public on October 17-18. As part of the annual Lighthouse Challenge, locals and visitors can experience the state’s remarkable maritime history by climbing to the top of working lighthouses, soaking in the spectacular ocean views, and enjoy a host of inviting coastal communities without the summer crowds. Participants in the Lighthouse Challenge will earn souvenirs at each site as they compete to visit every one. Proceeds from the Challenge will support the preservation of these treasured landmarks. During Challenge weekend, most of the museums and lighthouses are open from 8 a.m. until 6 p.m. There also are unique nighttime climbs of the lighthouses at Absecon, Cape May, Tinicum, and Tuckerton on Saturday from 6-8 p.m.
A complete list of hours of operation and fees is available at http://www.visitnj.org. There are many firsts associated with the Twin Lights, which tower 250 feet above Sandy Hook Bay on one of the highest points along the coast: the first Fresnel lens in the U.S.; site of Guglielmo Marconi’s first practical use of the wireless telegraph in 1899; and the first lamps fueled by kerosene in 1883.In 1898, Twin Lights became one of the first electrically lit seacoast lighthouses in the country. On exhibit are lighthouse and lifesaving station artifacts, plus films and slide shows. Features panoramic views of Long Beach Island, Barnegat Inlet, and Island Beach State Park, trails through one of the state's last maritime forests, a birding site for water fowl, fishing and scheduled nature walks and talks, and the nearby Barnegat Light Museum. Built in 1857, the 171-foot Absecon Lighthouse—New Jersey's tallest—hosts educational programs, weddings, guided tours, events, and more. A recent multi-million-dollar restoration includes a replica of the lightkeeper’s dwelling, museum, gift shop, and a Fresnel Lens exhibit. The 40-acre working Maritime Village has 16 restored and replicated buildings, including the Tucker's Island Lighthouse, a re-creation of the structure that fell into the sea in 1927. Exhibits tell the history of the U.S. Lifesaving Service, Barnegat Bay pirates, and the bay. Standing along picturesque Delaware Bay, East Point Lighthouse has guided commercial fishermen and pleasure boaters since 1849. This wrought-iron lighthouse with its unusual open-frame design, was built in 1876 and is listed on the National Registry of Historic Places. Nearby Fort Mott State Park is a 104-acre waterfront park with buildings and gun emplacements from the Spanish-American War. First lit on New Year’s Eve in 1880, this light is a key guide for ships heading north along the Delaware River. Known as the "Victorian Lighthouse", this unique "stick style" building was designed by Paul J. Pelz, who designed the Library of Congress. A working Lighthouse, it also features a museum showcasing the life of a Lighthouse keeper in the late 19th and early 20th centuries, plus a gift shop and award-winning English gardens. This National Historic Landmark, the oldest standing lighthouse and the oldest operating lighthouse in the United States, is the only surviving tower of the 11 lighthouses built in the 13 colonies between 1716 and 1771. It dates back to 1764, and has thick walls for protection from cannonballs. The Lighthouse Keeper's Quarters is now a museum. This is the last live-in lighthouse built on the Atlantic Coast, opened in 1896. Built to bridge the 40-mile gap between Barnegat Light and the Twin Lights of Navesink, it was decommissioned in 1945. The interior has been restored. 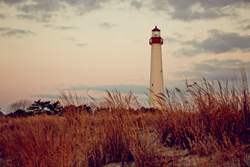 Built in 1859, the Cape May Lighthouse is still an aid to navigation. At the top of its 199 steps are spectacular views of the Atlantic Ocean and Delaware Bay. There’s an orientation center and shop. On nearby Sunset Boulevard is the recently opened World War II Lookout Tower, part of the Delaware Bay harbor defense system known as Fort Miles.